All sales are final. No returns will be accepted unless the product arrives damaged at the purchaser’s shipping address and EAW is notified via email (administrator@e-a-w.org) or phone, within five calendar days of the date the merchandise arrives at the original shipping address. EAW reserves the right to exchange any such damaged merchandise in lieu of refund. To be eligible for either exchange or refund, the damaged materials must be returned to EAW at 1000 Q Street, Sacramento, CA 95811, postmarked no later than six calendar days of the original date of receipt at the original shipping address. 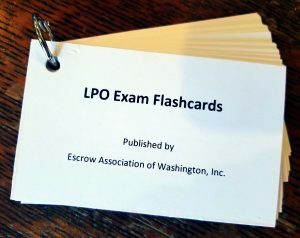 Study cards for the Limited Practice Officer examination. 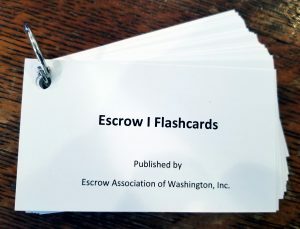 Study manual for escrow industry–entry level. NOTE: the Manual is distributed electronically as a PDF download to the email provided during purchase. 134 pages, eight chapters, including Glossary of Terms and practice tests for each chapter.